Gertrude Moakley is my tarot history muse and the wise and magical aunt I wish I could have had. Unfortunately, there doesn’t seem to be an image of her anywhere (Not true! See the comments below). I have to imagine her in the 1950s as a gray-haired librarian in tweeds and sensible shoes, a Waite Smith deck hidden in her purse, slipping away from her colleagues at the public library to have lunch with Eden Gray. After graduating from Barnard College then the Columbia School of Library Science in 1928, Moakley began a 40-year career with the New York City Public Library. In the 1950s, she published two articles in the Bulletin of the New York Public Library: on the Waite Smith deck’s influence on T.S. Eliot’s poem The Wasteland; and on the relationship between the Visconti-Sforza trumps and Petrarch’s poem I Trionfi. During the 1950s she also wrote introductions to a translation of The Tarot of the Bohemians by Papus, and to a reprint of Waite’s Pictorial Key to the Tarot. She was the first author to respect Pamela Colman Smith’s contribution to the RWS deck, and the first to call it the Waite Smith deck. Moakley and Eden Gray were acquainted, and Moakley seems to have been a fixture on the New York tarot scene in the 50s and early 60s. Even though she appeared on a radio show that featured psychic phenomena, we have no evidence that she read cards herself, and we don’t know what she thought of using tarot for divination. Her greatest achievement was the 1966 book The Tarot Cards Painted by Bonifacio Bembo for the Visconti-Sforza Family: An Historical and Iconographic Study. For the first time, tarot was set in its medieval context without the distraction of irrelevant occult theories. Moakley said on more than one occasion that she appreciated the beauty and complexity of A. E. Waite’s symbolism, but she deplored how occult theories and mythology had contaminated tarot history. Although Moakley pioneered rigorous research into tarot history, her conclusions were flawed. As she was the first to point out, both the tarot trumps and Petrarch’s poem were modeled on the triumphal parades that were an important feature of Italian civic life. Even though the poem and the deck share certain trumps such as Death and Love, Petrarch’s triumphal parade has no relation to the deck. For instance, he pictures Death an old hag in a black robe, not the skeleton depicted in the deck; and his trumps are in a very different order than the deck. Moakley also suggested an even more far-fetched theory, that the Visconti-Sforza trumps might depict a Carnivale parade, and the first trump, a man dressed in red sitting at a trestle table, is the sacrificial Carnivale king eating his last meal. Unfortunately, the book had no impact on the tarot community, which remained wedded to esoteric fantasies about tarot’s ancient origins until the internet made it impossible to ignore evidence to the contrary. 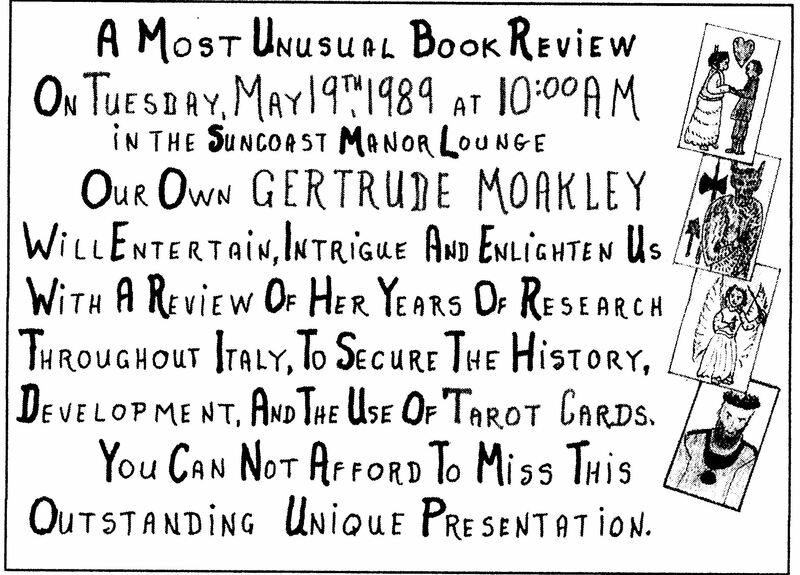 In 1989, ten years before her death at age 94, Moakley gave a talk on tarot to the residents of her retirement community. A member of the community drew fanciful tarot cards on the publicity poster, and the event organizer wrote to her afterward that “an hour later everyone in the lobby was still talking about it.” (Is this aging tarot historian seeing a glimpse of her own future?) Happily, Moakley lived long enough to see Tarot emerge from obscurity and enter mainstream American culture. Moakley was the first person to see the obvious – that the tarot deck is based on a sequence of medieval triumphs. Tarot would not be treated with such historic respect until Michael Dummett and Stuart Kaplan began publishing their research two decades later. Both of these eminent tarot historians referred extensively to Moakley’s research; and in 1980 Dummett praised Moakley’s deep learning, saying that hers is the only good book on Tarot ever written. Thanks to Moakley, it’s impossible to discuss historic tarot decks without considering their medieval origin. Gertrude Moakley was born on February 18, 1905 and died 15 years ago this month on March 28, 1998. I salute her dedication to historical truth and hope I can be worthy of her inspiration. Kaplan, Stuart and Jean Huets. The Encyclopedia of Tarot Volume IV, p. 669. Stamford: U.S. Games Systems, Inc, 2005. Illustration: A typical Florentine Triumph of Love. Commons.Wikimedia.org/wiki/File:Florence-petrarch-trionfi.jpg. Thank you so much for this picture. I’ve always wanted to put a face with all the facts about her. Such luminous eyes! She looks like she’s facing the future with confidence. LOL — I see that I’m a little late… about 2 years late. I just found that photo a couple days ago. I checked with Barnard College archives and received a quick reply that it is in the Public Domain, because the copyright was not renewed. Therefore, I put the image, and a retouched one, on Wikimedia Commons so that it might be more readily available. Moakley is mentioned in several volumes of the yearbook. Volume #30 notes that she was in the Glee Club; #31 just has her listed in the directory; #32 has the class photo, along with the slogan, “Your tree stands straight and tall”, and a mention of her in the Chorus; #33 just has her listed in the directory; #34 has her mentioned as winner of the Tarlock Prize in Latin, (for excellence in sight translation of Latin); and #35 also has her listed in the directory, along with her position as a substitute H.S. English teacher. All good detail for her bio. Just thought I’d pass that along. Michael, Thank you so much for that information. Gertrude fascinates me and I want to know as much about her as I can. I think it’s because I relate to that article in Kaplan’s Encyclopedia about her giving a talk on tarot in her retirement home. That will be me in a few years.